Columbus Ohio Gay Lesbian Ally Hockey Association – Page 2 – Lace up….skate OUT! Hockey season has begun, and we have two great events lined up. 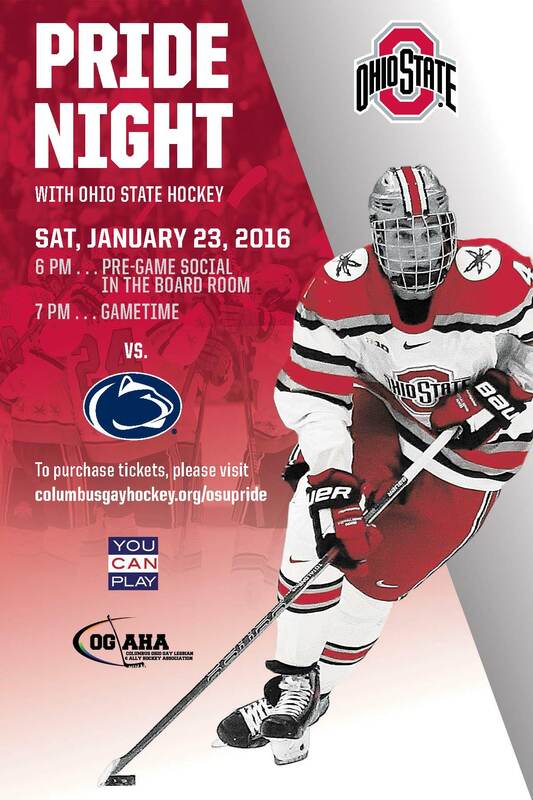 On Jan 23rd, in conjunction with The Ohio State University’s Men’s Ice Hockey team, we will host our Pride Night with Ohio State Hockey. Tickets are only $14! That is a 20% savings over Ticketmaster and their fees. Tickets will be held for pickup at a special Will-call table for Pride Night attendees only. Tickets include access to the VIP Boardroom lounge located at ice level behind section 127. Enjoy a cash bar, TVs, drink specials, and more. you can purchase a buffet (includes soft drinks in the Boardroom only), for only $15. That is another $3 in savings over day of game. For those coming in from out of town, we have a discount hotel rate in the Short North. See ticket page for details. Doors open at 6PM and the game starts at 7!